Scenarios have become a popular tool for trying to capture what the future of a rapidly changing Arctic could potentially entail. These range from scenarios of climate change, informed by computer simulations of how the climate system and weather patterns might respond to increasing greenhouse gas emissions, to participatory community workshops aimed at both capacity building and gathering information about local priorities and perceptions. In REXSAC, scenarios are seen as a tool for co-production of knowledge across academic disciplines and with others who have an interest in extractive industries and sustainable development (RT9). As one step of moving from concept to practice, we organized a methods workshop on Arctic indicators and scenarios in Stockholm 7-8 September 2017 to discuss some of the shortcomings of the approaches used so far. The goal was also to investigate how scenario methodologies could potentially inform the further development of indicators for sustainability. What did we learn? For me, the most important take-home message was that while research-driven scenario exercises can be fun and creative, they do not necessarily speak to policy-makers. They may have even less influence on the regulatory processes where decisions are made about new mines or other infrastructure related to extractive industries. We didn’t discuss to what extent indicators of human development, such as those developed by the Arctic Social Indicators project, or indeed environmental indicators had impact on decision makers, but I suspect that there is a similar gap here between research and regulatory practice. It calls for a future research agenda that much more closely links academic efforts to the development of best practices for assessing the long-term impacts of extractive industries on sustainable development. A second take-home message was that we need more attention to identifying whose voices are heard in developing narratives about Arctic futures. The issue is not new, but we continue to struggle with the practical and funding implications of engaging with diverse groups of stakeholders. It’s both a matter of who gets space to speak in a specific setting, where power imbalances are parts of the context, and how to weigh a wish for engagement against the risk of stakeholder fatigue. A third take-home message was how difficult it appears to be to go beyond the present and to imagine the unimaginable future. The Arctic has already brought many surprises with far-reaching impacts on the future of the region. The 2007 sea-ice minimum is a case in point, but it is far from the only extreme climate change-related event in recent years. Shifts in political discourse can also be abrupt. For many researchers, there is an onus on not being alarmist, but being too conservative in assessments of potential future development carries its own risks. It makes us less prepared for unpleasant surprises. We thus need to explore the extremes and their potential consequences. A fourth take-home message was that there is still a void in collaboration between narrative and quantitative approaches. Not everything can be captured in numbers and narrative approaches that focus on qualitative data and story-telling bring new insights to discussions about the future. However, it is important to make a link to quantitative data when it is relevant, and when numbers can help bring urgent messages across or add to the analytical power of scenarios. 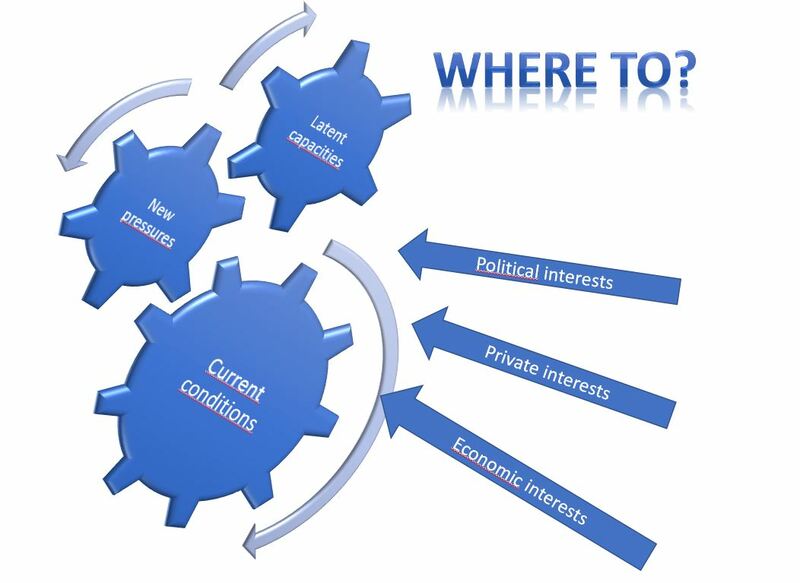 This is one area where connecting participatory scenarios approaches with on-going work on social and environmental indicators could provide the leverage that is necessary for bringing thinking about the future into decision-making processes about extractive industries. It is often far from obvious what sustainable development means in relation to extractive industries and Arctic communities. Exploring the question together with a range of actors and employing a long-term perspective of potential future development, including the risks related to the unimaginable, would be one important step toward developing impact assessment practices that take rapid social and environmental change into account.